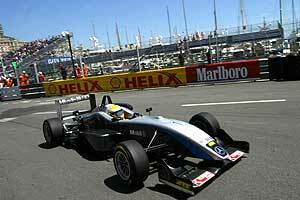 In the qualifying session for the Formula 3 Euro Series Monaco Grand Prix, Lewis Hamilton (ASM F3, Dallara-Mercedes, 1:28,593 min) succeeded in securing the pole position. At the 3.340-kilometre Circuit de la Principauté, the Briton will be the pole-sitter on the grid for the seventh and the eighth rounds respectively. This means that the McLaren protégé secured already his fifth pole in the 2005 season so far, with Adrian Sutil (ASM F3, Dallara-Mercedes, 1:29,202 min), Loïc Duval (Signature-Plus, Dallara-Opel, 1:29,316 min) and Franck Perera (Prema Powerteam, Dallara-Opel, 1:29,523 min) completing the first two rows of the grid. The 23 Formula 3 Euro Series drivers contest only one qualifying, during the Monaco Formula One GP weekend, therefore, the result of this session was decisive regarding the grid positions for both rounds of the weekend. Lewis Hamilton secured the pole in superior style by setting a lap time 0.609 seconds fastest than the one of his closest chaser. In the very last seconds of the session, Hamiltons team-mate, Adrian Sutil, moved up to second place, thus pushing French driver Loïc Duval away from the first row of the grid. A remarkable effort as the German had to contest the final five minutes of the session with a twisted rear wing after having spun in Poitiers, short before the tunnel, and making slight contact with the tyre walls. Due to several yellow phases, it was anything but easy for the drivers of the most competitive young gun series worldwide, to complete a fast lap. Esteban Guerrieris (Team Midland Euroseries, Dallara-Mercedes, 1:36,365 min) qualifying session lasted just eight minutes. The Argentinean missed the Swimming Pool chicane and skidded into the crash barriers, thus destroying his complete front suspension. After 15 minutes of the 30-minute qualifying, Hannes Neuhauser (HBR Motorsport, Dallara-Mercedes, 1:32,664 min) spun and stranded close to the tyre walls  and the session was red flagged. But at the end of the day, the Austrian could continue.